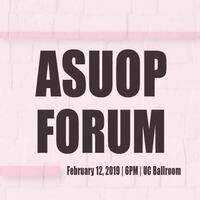 If you have any concerns or questions about ASuop, you can have them answered by talking with ASuop members at our upcoming forum on February 12 at 6pm in the UC Ballroom. Find out about planned events for the semester, tell us how we can improve, ask away! We want to hear from you. Don't miss out!